One afternoon while at fashion week, I got a makeover by Charlotte Tilbury‘s team of beauty experts. Charlotte is a world-famous makeup artist, having worked with the likes of Kate Moss, Stella McCartney, Mario Testino and more, who recently decided to launch her own line of luxe beauty products! For her collection she created 10 full makeup looks, ranging from The Ingenue to The Vintage Vamp. There’s a look for everyone! Click here to shop the collection and find a look that’s right for you! I tried to keep myself from shopping while I was in New York this time, but of course, I failed. Clearly I have color on the brain since I picked up this pink pair of pumps, these red Schultz shoes (at the new Piperlime!) and this baby blue Topshop coat. Can’t wait to wear the coat in London at the end of October! The pink pumps were a new thing for me, since pink usually isn’t my color – for some reason, I just love the idea of pale pink for the cooler months. It seems a little more unique and a little less girly than wearing the shade during spring/summer. I’m tempted to buy these sunnies too – tried them on at Kate Spade’s store on Madison and fell in love! Speaking of pink, can we please take a minute to talk about this rug? Major. #6 is so cool, love this shade of pink. Have fun at your party! I wish I could go! I’ll take #1 and #10 any day! I really like these rose gold and blush tones. The eyeshadow palette and pink pumps are everything. Enjoy your event. Such a pretty color palette! Gorge. That is the most beautiful run that I have ever seen, that shade is perfection! I wish I lived nearby would definitely stop by! Gorgeous color scheme for this week’s edit! Love the Kendra Scott earrings and that tan sweater. Ahh I want one of everything! 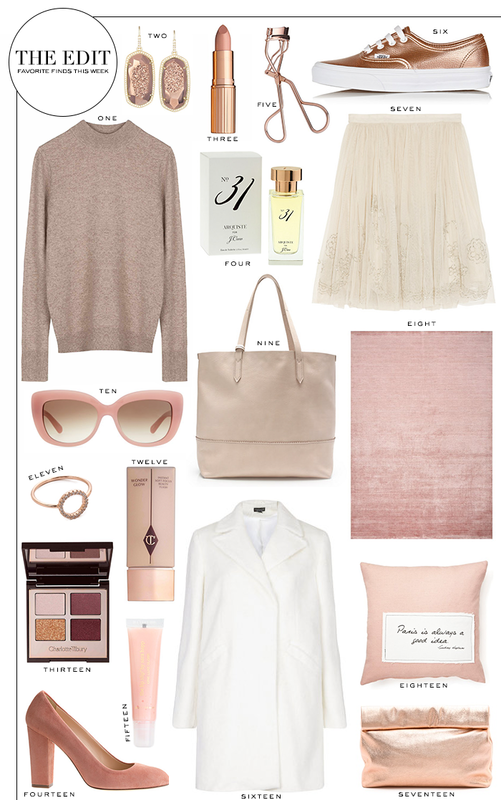 I love the blush neutrals! Such great picks! You put together the best collages! I love the blush theme and that skirt is beautiful. gorgeous palette! Love the eye shadows, sunnies & and that tote. Beautiful color palette! It reminds me of a ballerina dancing into fall! Loving this colour palette Merritt! You create the best collages. Have an amazing event at Neiman Marcus tomorrow! ok rose gold I see you, love this! Love all of the pink and white! The pumps are my favorite, but I love that bag too! Wow! I am obsessed with all of these picks, especially 1, 11, and 13! I need numbers 1 through 18 please..! I can’t wait to see how you style that Topshop blue coat! and those pink Kate Spade sunnies are now on my wish list! I love the idea of pale pink in the fall, too. So unexpected! That Needle & Thread skirt is amazing. Can’t wait to see the Topshop coat on you! I need a baby blue coat! I’ve been dying to try Charlotte Tilbury’s line! I heard it’s amazing.